Work to the Bromley Heath Viaduct is nearly complete. The contraflow on the ring road was removed in late April and the westbound carriageway over the viaduct reopened to traffic on 30 April. The new shared use pedestrian and cycle path opened on 27 April. Please note that all traffic signal movements on the A4174 have been reverted to their original settings from before the viaduct work started and all ring road lane movements have been reinstated. This includes the 2+ lanes and all lane changes at the Hambrook lights. Some local road closures remain in place under experimental orders. Work to clear the site continues and we will keep local residents informed of our plans to landscape the compound site. On Tuesday 26 June and Wednesday 27 June 2018 the westbound carriageway of the A4174 ring road will be closed to allow for the removal of a temporary bridge underneath the viaduct. The closure will be from Wick Wick to the Hambrook lights and will be in place overnight from 9pm to 6am only. The extent of the maintenance being carried out on the Bromley Heath Viaduct will require the southern viaduct to be closed to all traffic for the duration of the project. This is because the removal of the worn out parts of the structure will mean that it is too weak to safely carry any traffic until the maintenance is complete. 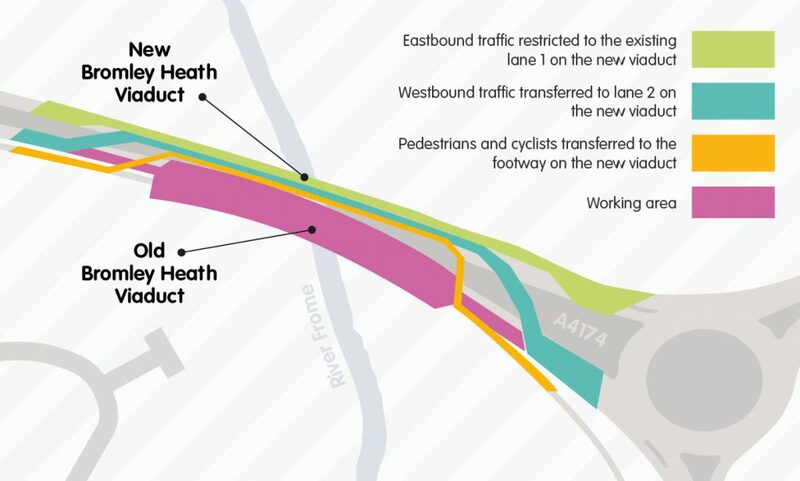 Therefore, a crossover link will be created for the duration of the work, see the map below that illustrates how people and vehicles will be able to travel over the viaduct. 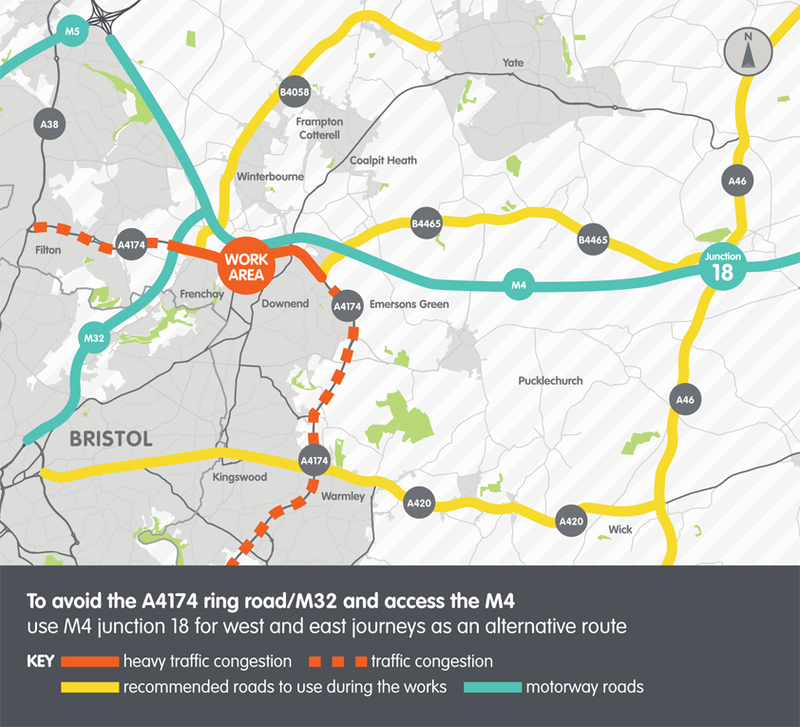 Use M4 junction 18 for both west and east journey as an alternative route to avoid the A4174 ring road and access the M4. We have installed new traffic lights at the junction of the B4465 with the A46 to make it easier to access the M4. Signs warning of the delays will be displayed on motorways and major routes throughout the wider region. Residents in surrounding villages told us they did not want us to close numerous local roads to prevent residential areas from becoming alternative routes. We have listened to their views and changed our traffic management plans and will only be closing narrow lanes where large volumes of traffic are not suitable. Access for residents and walkers and cyclists will be maintained. 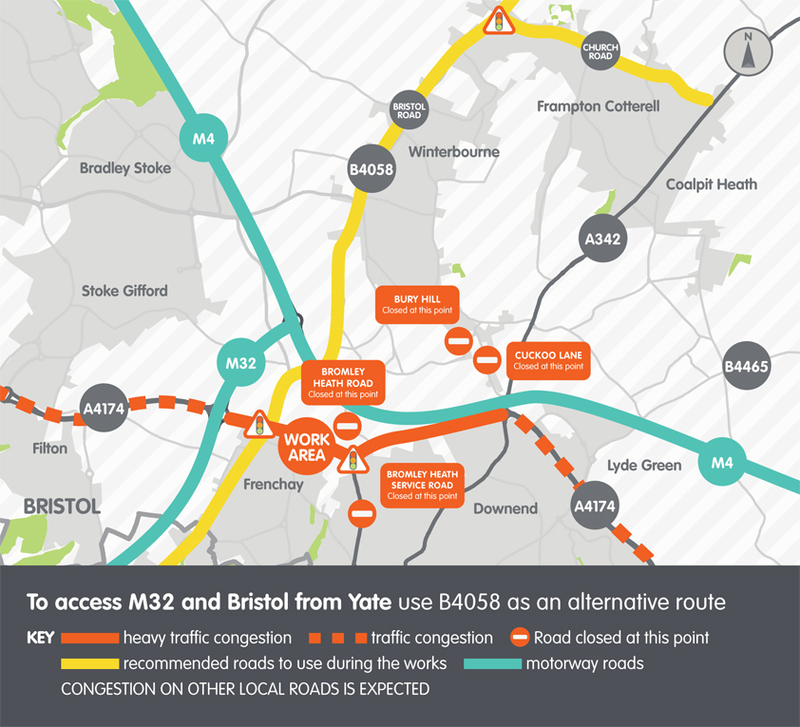 People travelling from the Yate area who wish to access the M32 for Bristol are advised to use the B4058 through Winterbourne and avoid the works area, instead of the A432 through Coalpit Heath. 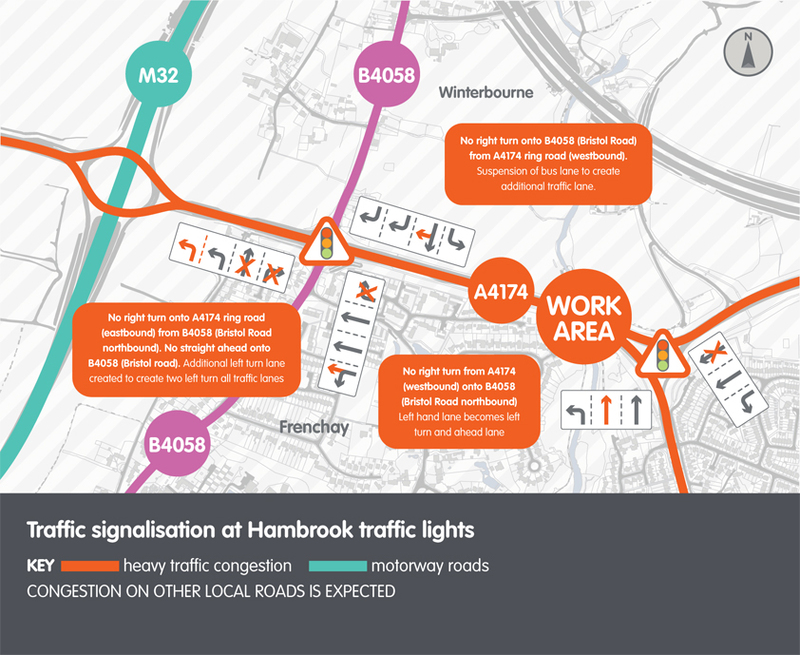 There are a number of changes being made to the direction at the Hambrook traffic lights on the ring road. These are being made to maximise traffic flow east to west after the work area on the A4174. Changes being made to the direction of travel around the roundabout will help traffic merge into a single lane before the contraflow. This is one of the busiest sections of the A4174 and will cause significant delays. We understand that this scheme may cause disruption and disturbance to residents, communities and businesses and would like to apologise in advance and kindly ask for your patience whilst this work is taking place. To help facilitate traffic movements and alleviate traffic congestion during the works, we will be out in force monitoring junctions, traffic lights and yellow boxes when the contraflow goes into operation. We are operating a flexible approach to the traffic management and if considered necessary and appropriate, we will implement traffic management measures to help ease congestion where possible.